The Lost Weekend is certainly the darkest film we have viewed to date. The story follows a man’s tragic life ruined by alcoholism that reaches its apex, the lost weekend – a four day bender. The troubled character Don Birnam is portrayed by Best Actor winner Ray Milland, a far cry from the comedic roles he had previously starred in. Billy Wilder won the Best Director Oscar and shared the Best Writing Screenplay award. The stark black and white cinematography gives the Manhattan street scenes a gritty feel. Scenes filmed at Manhattan’s Bellevue Hospital detox ward add to the realism. The film’s edginess is created in part by the unexpected actions of an alcoholic and the audience’s instinct to wish this seemingly nice guy character not to indulge again (or steal that woman’s purse). The film is backed by a very strong cast of supporting characters including Jane Wyman who plays Helen St. James, Don’s girlfriend. Despite the strong performance, I do feel that Wyman’s character lacks the development necessary for me to understand why she would remain in such an obviously dismal relationship. Howard Da Silva plays Nat, the bartender, who struggles with the dilemma whether to provide his needy patron the rye whiskey he so desperately craves or whether he should cut Birnam off and allow Don to be subjected to intense withdrawal symptoms. Doris Dowling plays the prostitute, Gloria, who hangs around Nat’s bar and has a fondness for Don Birnam. She has quirky habit of truncating multi-syllabic words like “don’t be ridic”. I had to wonder if the film’s 1945 release may have foreshadowed the unfortunate problems facing many returning World War II veterans. In the context of today’s society, Don’s alcoholism could easily be substituted for a myriad of additive habits that can ruin a person’s life and greatly impact family and friends. I’m glad I watched this film because it is the first of six Academy award wins for Billy Wilder, although I more thoroughly enjoyed Double Indemnity, his 1944 film that was a Best Picture nominee but lost to Going My Way. While I am a Billy Wilder fan, The Lost Weekend is not a film I would view multiple times due to its depressing subject matter. Released just three months after V-J Day, The Lost Weekend is our first film since Gone with the Wind to be released outside of the context of WWII. Rather than deal with any of the myriad of issues accompanying a nation robbed of a generation of young men, the film tackles a different blight upon society, Alcoholism. DISCLAIMER: I am not seeking to juxtapose any of my own personal opinions on the topic in this review, I am merely critiquing and recapping the events portrayed in this film. In order to contextualize this film, it is important to describe a couple of important historical developments that had a large impact on alcohol use and abuse in America. Spanning from 1919 to 1933, the Unites States were prohibited from imbibing alcohol due to the 18th Amendment to the US Constitution: Prohibition. When we view Prohibition from a historical context, one often is presented with romanticized versions of bootleggers and gangsters evading authorities to deliver booze to speakeasy’s and other establishments of ill-repute. However, the side of the 20’s that is not seen is the huge spike in alcoholism and binge drinking. The film briefly mentions this phenomenon, as the main character is detained in the drunk ward of a hospital. A ward which the film explains was founded to combat the drinking issues that stained Prohibition. Alcoholics Anonymous (AA) was founded two years after the repeal of Prohibition in 1935, to help people find relief and support in dealing with their addiction. The book that the film was based on was a semi-autobiographical novel that Charles R. Jackson wrote, which chronicled the lowlights of his addiction as well as a cerebral look at the mindset of an addict. Jackson would go on to speak to groups such as AA about his addiction, and to bring awareness to others. Our 1945 Best Picture winner was adapted from his seminal tome of addiction. As for the actual movie, I found it hard to watch at points but that was the intended effect for the audience. It is difficult to watch the main character forsake his loved ones and connections in order to fulfill his insatiable desire to drink. We are presented at the beginning with the image of the main character dangling a bottle of rye out of the window by a string, in order to elude his brother. As the two are about to go on a trip out to the country to escape Don Birnam’s drinking, Don (Ray Milland) disappears on a bender as the distraught brother decides to go on the trip alone. Now the audience is left alone with two main characters, Don and his addiction. The psychological aspects of the film make it difficult to watch, as we are subjected to the same train wreck his family and friends experience with each drinking binge. Our ability to empathize with the main character slowly disappears as each interaction illustrates a new rock bottom for our struggling writer. Ray Millard absolutely deserved his Best Actor win, for his ability to convincingly lead the audience on his self-destructive bender. This was also the first time a film that we saw utilized the film technique of neon signs and sights from the city flashing by the main actor, as he roamed the streets in madness. One of the most difficult scenes to watch involved Don Birnam stealing a woman’s purse at a bar in an attempt to pay his tab. The resulting confrontation was so cringe-worthy it was almost unwatchable. The Lost Weekend highlights the fact that a Best Picture winner can be extremely well done, but not enjoyable to watch. However, it is most important to view the film as an awareness piece similar to modern day substance-abuse films like Trainspotting, Requiem for a Dream, Winter’s Bone, Leaving Las Vegas and Candy. 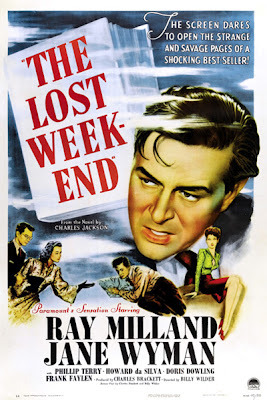 The Lost Weekend was really the first movie of its kind to raise awareness of a serious issue, without becoming a parody of itself like 1936’s Reefer Madness. Also I can’t conclude this review without mentioning the fantastic acting of Jane Wyman in the role of Helen St. James, Don Birnam’s overly sympathetic girlfriend. It was hard to watch her unrelenting support of her beau, regardless of the damage he caused to her and the people around him. I would not suggest watching this film unless the viewer is prepared for a heart-wrenching psychological thrill ride through the inner-demons of an alcoholic. I must admit though, this film was very important for advocacy and heightened awareness of this serious issue of the time that still rings true today.